Every year termite problems cost thousands of homes and businesses throughout the United States. A Termite exterminator can help you to stop the damage caused by these wood destroying insects. Termites can be found in every state in the country except for Alaska. The damage that they can cause to your home can cost you thousands of dollars. The first step in fixing any termite damage is to recognize the signs of termite infestation and to call for a termite exterminator. If you have thin, mud tubes running across the concrete or masonry you may have termites. You may often find the discarded wings from the termites. If your wood has a hollow sound when you tap it, that may be signs of termite damage occurring inside the walls. If you notice cracked or distorted paint surfaces on your walls, that could be a sign that you have termites in your walls. If you have wooden building parts that are beginning to sag, this could be caused by termites. 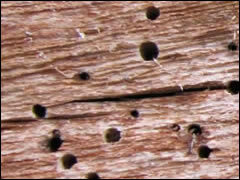 If you notice frass (wood color droppings) this is a sign that termites are eating through your wood. Termites are wood destroying insects that love to chew on wood. If you have a termite infestation they can cause you thousands of dollars in termite damage. Your home can be a perfect nest for these insects. If you notice any of the signs of termites you need to call for an inspection. Left untreated, termites can destroy the value of your home. One of the areas of the home that can be most susceptible to termite damage is where wood meets soil. Termites are a subterranean pest and will move from soil to wood easily. A termite exterminator can help you to stop the damage that these wood destroying insects cause. Don’t let your home become structurally damaged, call a termite exterminator today.